I’ve said it hundreds of times. And it’s (mostly) true. Most companies already rank #1 for their brand name, so there isn’t much to worry about. That’s why SEOs are so obsessed with the non-branded keyphrases. That third type, the branded keywords, are usually ignored by SEOs. But actually, they provide powerful insights for marketers and website planners. Brand searches are a secret weapon for content strategists because they hold powerful clues about our audience. Let’s take a minute to make sure we’re getting the maximum value from these types of searches. They are called navigational queries because people who search for brands are usually trying to get to a specific company website or webpage. This explains why these phrases have ultra-high click through rates. 50% or more of people who search for brands click on the top ranking webpage. And it’s usually the brand. When people look for your brand, they give you clues. They are telling you what they want from you. What they need. They also attract the most qualified traffic. You just need to find those phrases and address those information needs. Note: This research works best for bigger brands. Smaller brands may have trouble finding insights here. But the research is so easy, everyone should do it. 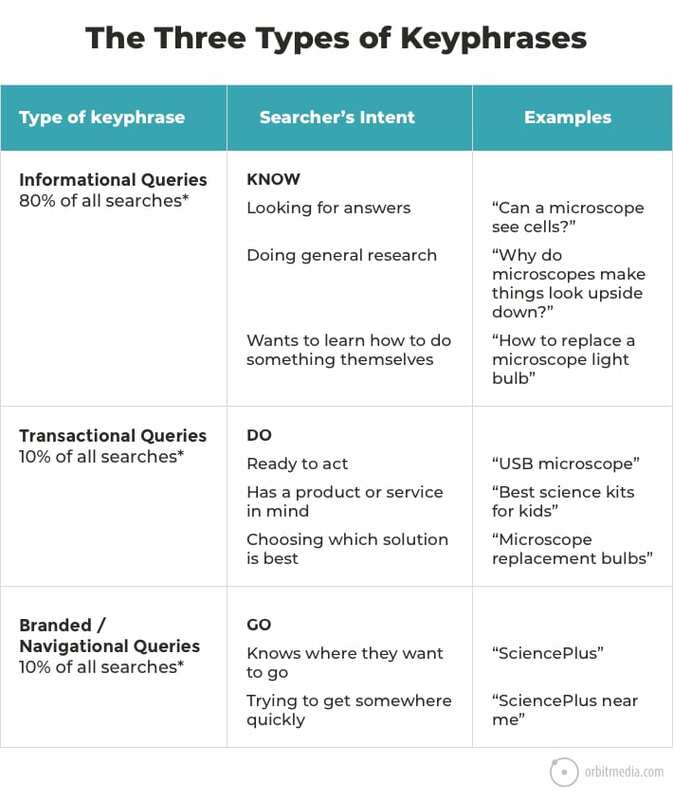 How do I find my branded keyphrases? They are very easy to find. Here are three sources of branded keyphrases. To find them all faster, go to KeywordTool.io. It scrapes all of the suggested phrases out of Google and puts them all on one page as if you typed in the next letter of the alphabet 26 times. You can see suggestions from Google, but notice the other tabs at the top: YouTube, Bing, Amazon, etc. Another source for branded keyphrases is the “Searches related to” queries at the bottom of the search results page. If you search for the brand, this will look a lot like the suggested phrases you’ve already found. But search for one of those suggested phrases and you’ll get deeper insights. 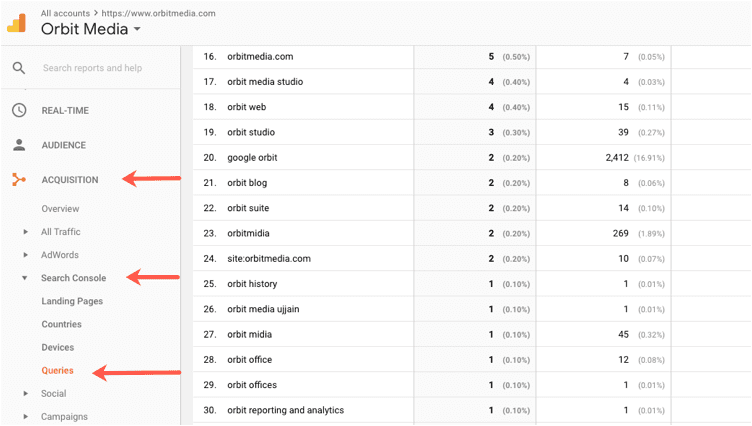 There is a lot of keyword data in your Google Analytics, assuming you’ve connected Google Analytics and Google Search Console. Haven’t done this yet? Here’s our Google Analytics Setup Instructions. Got to Acquisition > Search Console > Queries. Now you know what people are looking for when they look for you. There are five different types of branded keyphrases and five ways to optimize for them. Here’s the breakdown. 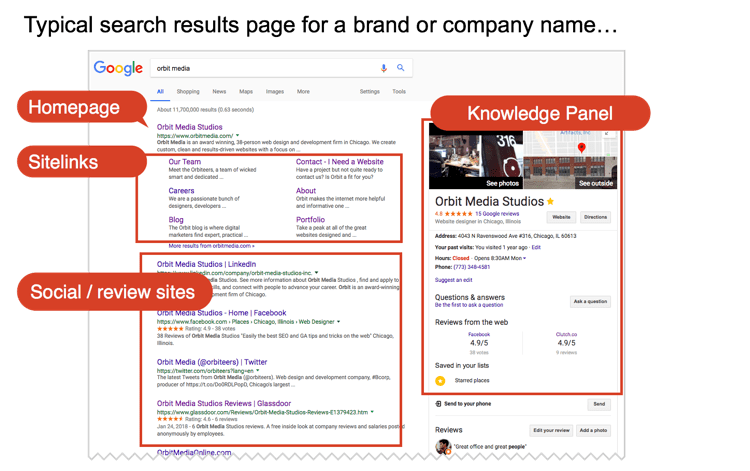 It may also include a map and local 3-pack, news, interior pages, the wikipedia page and ads if you or competitors buy Google Ads for your brand name. Do you see star ratings and reviews at the top of the page? If you don’t have 4.5 – 5 stars in each of those websites (Yelp, Glassdoor, etc.) you’ve got two options: Get some better reviews (hopefully, you’re good at what you do and you have a few fans who will say so online if you ask nicely) or push down those reviews . This kind of SEO is about pushing bad stuff down. It’s part of reputation management and digital PR. 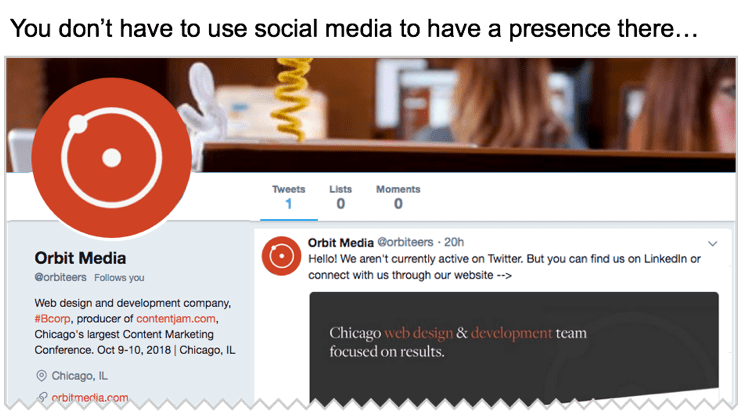 And the fastest way to do this is to create social media profiles. These often outrank review websites and push down those ugly stars and that news story about that horrible lawsuit. Got an “About Us” video? Create a YouTube channel and post it there. It may rank high in Google search results, pushing down review websites with negative reviews. Note: You don’t have to be active on social media to have a presence there. Just create your profile and create one post. The post can let them know that you don’t use that network and suggest they find you on another social network or on your website. Here’s what our Twitter account would look like if we didn’t use Twitter. These searchers are more likely to be on mobile probably using voice search. They are more likely to find some basic info right there on the search results page, so they are less likely to click and visit. 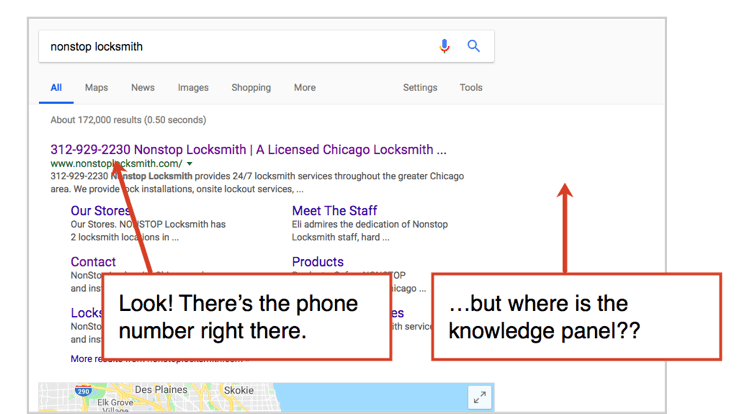 Google is very good at quickly showing basic brand info and answers. This is what the “knowledge panel” is all about. So to optimize for these branded phrases, make sure to claim your Google My Business page and fill it with as much information as you can. Starting by making sure you’re using the correct business category. Then upload some great photos. Add your business hours and everything else on the local SEO checklist. If they’re looking for reviews, you need a plan to get positive reviews on all the sites that rank. Make this a priority. Star reviews are visible even if the searcher doesn’t click on Yelp or Facebook or Glassdoor or Houzz or Reviewzel (I made that one up). They’ll see the stars. To push those review sites, make a reviews page of your own. 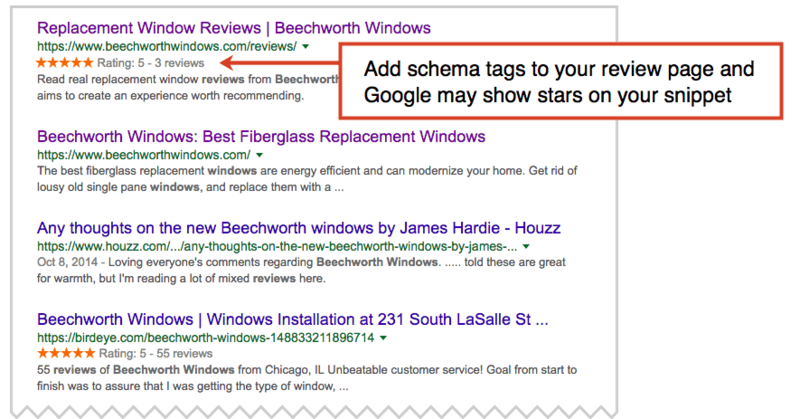 Then add schema tags to your reviews page to get stars of your own. Ask your developer for details. Beechworth Windows has a review page that ranks higher than the review sites for the branded keyphrase. Reviews also appear in the knowledge panel. 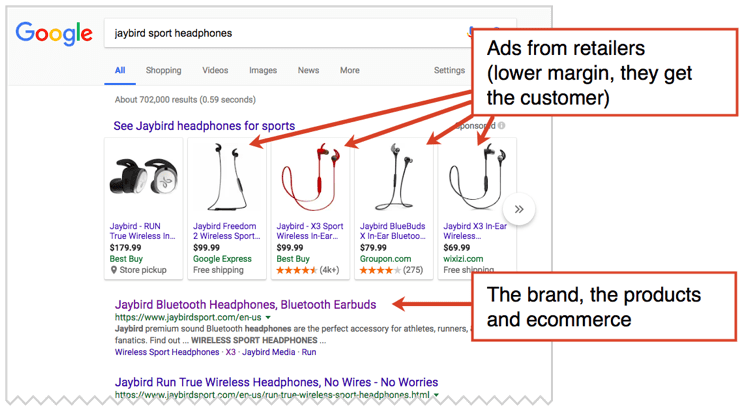 If you have an ecommerce site and you’re not the exclusive source of your products, it’s likely that retailers are buying ads on your product names. You might rank #1 organically, but the ads appear above you. If they get the click, they’ll get the sale. They get a cut of the profit and they get the customer data and chance for loyalty. Not good. To better compete with these ads, you can add sales language to the title tag of the page. Is there a promotion, an offer, free shipping, etc? Compare these two examples. Which of these has a better chance of competing with the ads that appear just above it? If you’ve got a shopping cart and your shopping cart has an empty box labeled “promo code,” then you’ve got a trigger telling your visitors to go look for a bargain. Search for each of these. Is anyone outranking you? If yes, your job today is to optimize for these phrases and outrank Coupon Basement and BargainHub. (I might have made those up too). Just make a page and optimize it! It will likely rank #1 within a few days. Give it a title such as “All the Current, Official Promotion Codes for [Brand]” and welcome that visitor back from Google, right into your arms. Of course, keep the page updated with all of the current promotions. If there are no current promotions, let the visitor know with a prominent message. And since most of these visitors will already have something in their cart, make the checkout easy to do from this page. Note: this page does not have to appear in your navigation. It can live within your sitemap without cluttering your header! This one I’ll never understand. 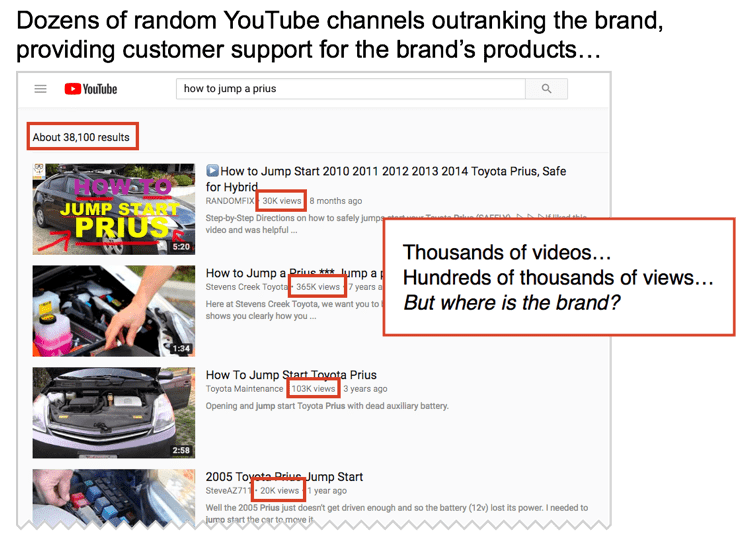 Brands often forfeit the opportunity to support their customers with YouTube videos. Instead, they let everyone else provide customer service. You find dozens of helpful videos. Some of them have been viewed hundreds of thousands of times. But where is Toyota? Why aren’t they here to help? This happens partly because brands don’t know that people are doing these branded product searches. But these phrases are very easy to find. You can use the “YouTube” tab in KeywordTool.io and look for each of your products. Or just search for your products on YouTube and see what’s getting viewed! See anything? Make the video, put it on YouTube and optimize it to rank. Here’s an interesting idea. Put your phone number right into the title tag of the homepage, so visitors will see it when they search for your brand. This could make sense if you provide a service to people who need help urgently, like a locksmith. This could hurt your rankings for non-branded phrases, reducing visibility among new customers. Tapping that won’t call your number. This is really what the knowledge panel is for. Visitors can tap to dial. The first two are also filled with open opportunities for your competitors. Not good. The third one only appears if you have a Careers page on your site. 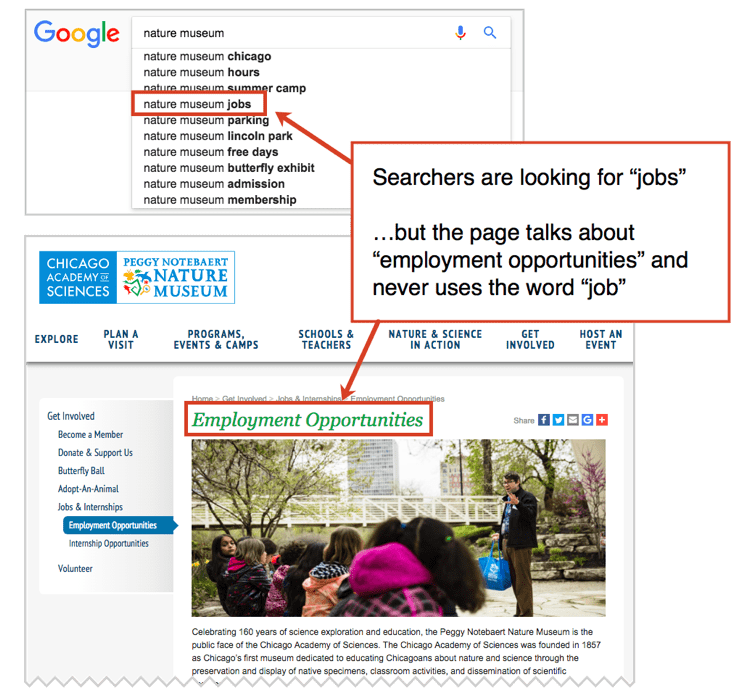 If you have a careers page, but you’re being outranked by the job boards, take a close look at it. Is it optimized for the phrase they’re searching for? Don’t forget the SEO Basics! If someone is looking for a phrase that includes your brand, you should have a page for it. That’s the main takeaway of this article. All those phrases you found when you put your brand into KeywordTool.io? Search for each of them. See what your audience sees? Can they quickly find what they’re looking for? If not, make a page for it! 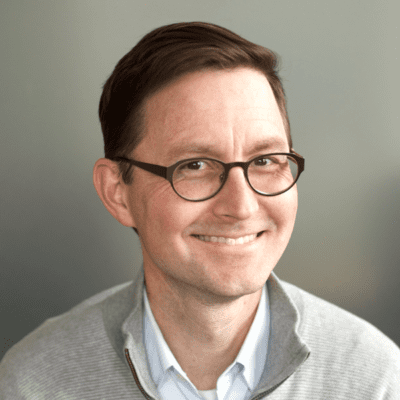 Why do most SEOs ignore branded keyphrases? Pay-per-click marketers talk about them a lot. (Should you buy ads for your company name? Should you buy ads for the names of competitors?) But it’s rare to hear any advice about the organic SEO opportunities of branded queries. Why? Because clients don’t ask about them. Because brands take them for granted. And because people rarely Google themselves. But it’s crazy to ignore the people who are looking for you. Whenever someone asks me to review their website, I start by searching for their brand. Because Google.com is their real homepage. And because the brand name is the top keyphrase for most websites. The good news is that branded keywords are super easy to rank for. It’s your brand! Just make the page and you’ll likely see yourself at the top of search results in a day or two. Why let someone else outrank you for your name? But it happens all the time. So find those phrases, optimize and make sure your audience finds you. This is such an interesting post. Keywords are absolutely crucial in the context of the SEO of your website and its ranking by popular search engines. However, the most important thing for your domain name is having something that people will easily remember and associate with your business. Cramming your site with keywords can actually have a negative impact. You did an amazing job here. Your article is super valuable. The fact is, optimizing you brand name is crucial to your business success, as many of your target market who do not know your business or brand URL will only search for your brand name. And if your band is well-opimized, it will show up prominently on search result. 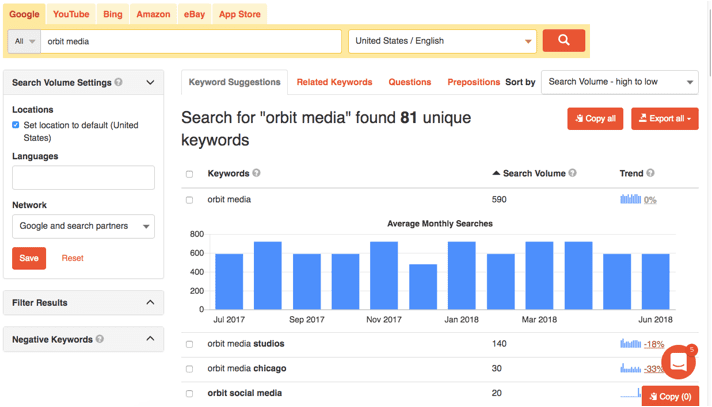 However, my takeaway here is the “Keyword Tool,” the best alternative to Google Keyword Planner. I actually have been using Google, SEMrush, and KWFinder. I never knew about this Keyword Tool, but now i do. I actually gave it a run before writing this comment. Thanks a lot for sharing, Andy! NB: Bytheway, i already schedule this article for posting on social media. Great work, Andy! When looking for branded keywords, I like using SEMrush in conjunction with KeywordTool.io and GKP. Anyway, thanks for this piece! Thanks for the great tips! Always great to get more reminders about why it’s so important to keep the customer in mind when creating content.